7 Kids and Us: Savannah Sunrise on DVD May 16th! The road trip of a lifetime begins when the uplifting family comedy, Savannah Sunrise, arrives on DVD at Walmart, Digital HD and On Demand May 16 from Anchor Bay Entertainment. Shawnee Smith and Pamela Reed star as a daughter and mother-in-law who discover that they need each other more than they know after a disastrous road trip gives way to understanding. Praised as, “a delightful family-friendly movie filled with both humor and heartwarming moments” by the Parents Television Council, the film was awarded the Dove Approval for All Ages. 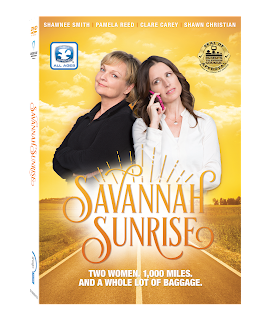 With bonus content like cast interviews and a behind-the-scene featurette, the Savannah Sunrise DVD will be available at Walmart for the suggested retail price of $14.98.